Rehab Or Die: It's pretty bad when you have to re-read your own blog to find out where you are. It's pretty bad when you have to re-read your own blog to find out where you are. Slacker. Yeah, that's me. Blog slacker. Here's where things stand now: Starting at the top (literally) the 3rd floor bathroom is mostly framed in, at least enough for the plumber to run the stack and water lines for installation. Instead of using a framing square to square up the walls, we've moved to using nearby hardibacker board or OSB as you can see in the picture. It makes for a decent square, and it harder to move once it's on the floor than a framing square. And we're always misplacing the square and since the OSB is EVERYWHERE, so, wth. 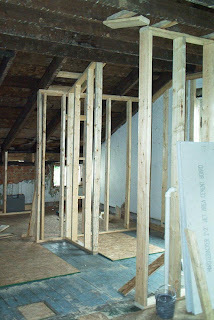 We have also finished reinforcing the master bath tub walls on the second floor. (framing the 10' ceilings can take a bit of adjusting, but in the end, they're rather sturdy. We've been noticing that the floor under the bathroom on this floor is still a bit more flexible than we'd like and since we'll be tiling the floors, it looks like we're definitely going to have to firm up the floor joists with blocking before we tile. Good thing that can be done a little further down the road. Also on the 2nd floor, the office floor has been laid out and covered with OSB, and the stairs to the 3rd floor still need to be finished up and the knee wall framed in soon. 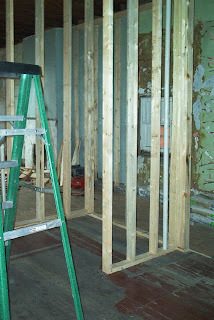 The OSB nest to the stairs in the picture is to represent where the knee wall is supposed to go. We quickly noticed how dark the stairs from the 1st to the 2nd floor were going to be, so it is our intention to cut and frame small windows in 12"x12" cuts and to wire them for lighting and place them all on a 2-way dimmer switch. It should be very cool. The other idea is to fill the cutouts with a resin epoxy, embedding the 'concealment shoes' (see previous post) in it epoxy and placing them in the cutout windows. Also, we've discovered that we're going to need to pull down all of the plaster on the west wall (the wall underneath the stairs-- all the way from the front of the hallway down to the first floor. We've come to the conclusion that it just doesn't make any sense to spray closed cell spray foam to insulate the house, but leave an entire brick wall exposed to the elements. 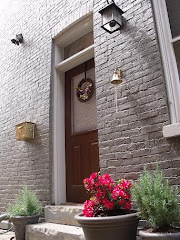 We already live in a similar old brick home a mile away, and I'll tell you that in the Winter, if you were to stick your tongue out and lick the wall, it would freeze to it. So we're going to insulate the wall. But we also don't want to give up any space in the stairway or hallway, so to compensate, we'll tear down the 1" plaster, place 1" furring strips on the wall and spray the foam to a 1"height. This way, we won't lose any space, but will gain an R value of approx. 7. Beats the hell out of frozen. We've also finished framing the vent wall for the WC on the first floor under the stairs (no picture yet)... which means our rough-rough plumbing is just about done. That's good news. On to the HVAC!! We're supposed to be visited by our HVAC assistant this week to plot out the cuts we'll need to make in the basement ceiling joists to accommodate the venting and the returns. I'm really not so thrilled with needing to cut two joists so near to the basement wall, but I'm told 'it's done all the time'. We're waiting to be told exactly where we'll need to cut, then we're on to the HVAC installation!! Then we can get in there and start pulling wire for the electric, lighting, communications, and sound. Things are coming along a lot faster now.